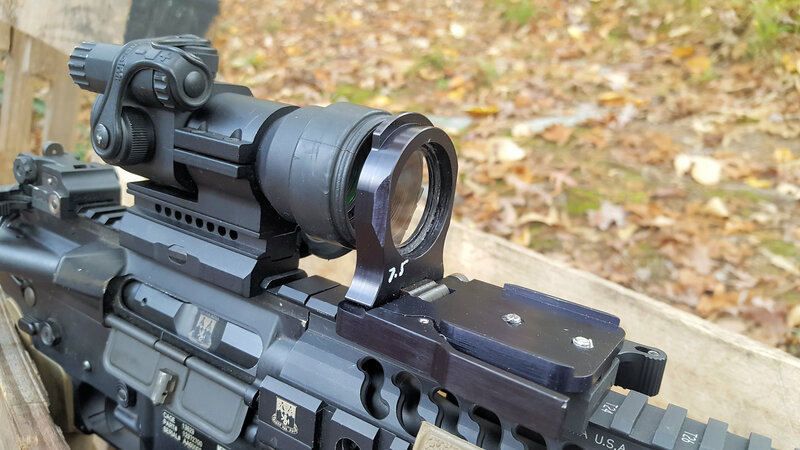 Alpha Tarac Optical Accessory: Flip-Up Lens Doubles Your Red Dot Combat Optic’s Point of Impact! (Video!) | DefenseReview.com (DR): An online tactical technology and military defense technology magazine with particular focus on the latest and greatest tactical firearms news (tactical gun news), tactical gear news and tactical shooting news. The test model I received set for turning a 200yd POA/POI into a 400yd POA/POA. Note the 7.5 written on the front, denoting the change in MOA that lens adjusts for. The body and base are made of aluminum and very robust. Alpha Tarac folded down. To put into operation, you must grasp and push in the large locking lever located on the right side. This frees up the lens to be flipped up by hand. Performance wise? In short fantastic! The Alpha Tarac did exactly what was advertised. When utilized, it adjusted how the red dot appeared. So, instead of having to use a hold-over to get a hit on a 400-yard plate, I was able to aim just about center on the plate to get hits on target at 400. Now, I won’t get into the math behind how the Alpha Tarac lens works, (and yes obviously muzzle velocity and different types of ammunition will play a part on where rounds impact), but variances in velocity and ammunition are considered in what TACOMHQ states about the capability of the Alpha Tarac. 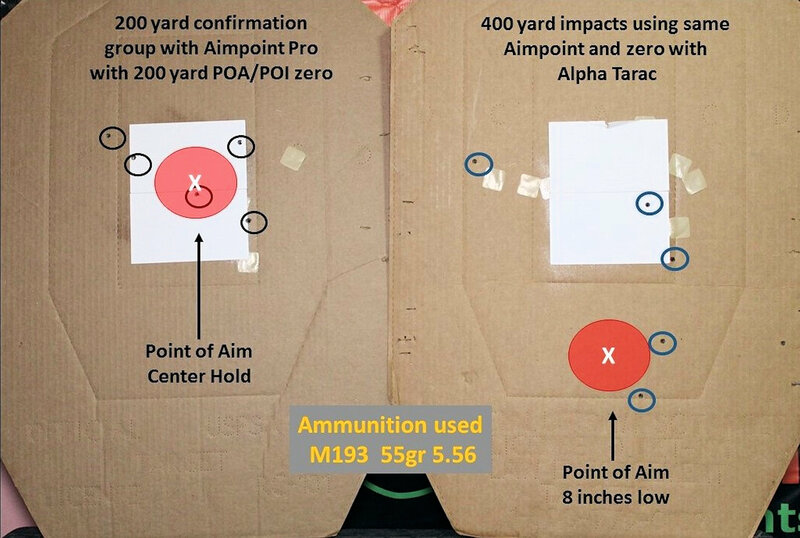 Speaking with TACOMHQ, they stated that when employed, it should be able to enable you to get hits on a 20″x20″ (20×20 inches) target at the range it was set for. 20″x20″ is basically a torso size target, by the way. This size pattern allows for variances in impacts from velocity and ammunition. So, just how well did the Alpha Tarac work for me? Let me show you. 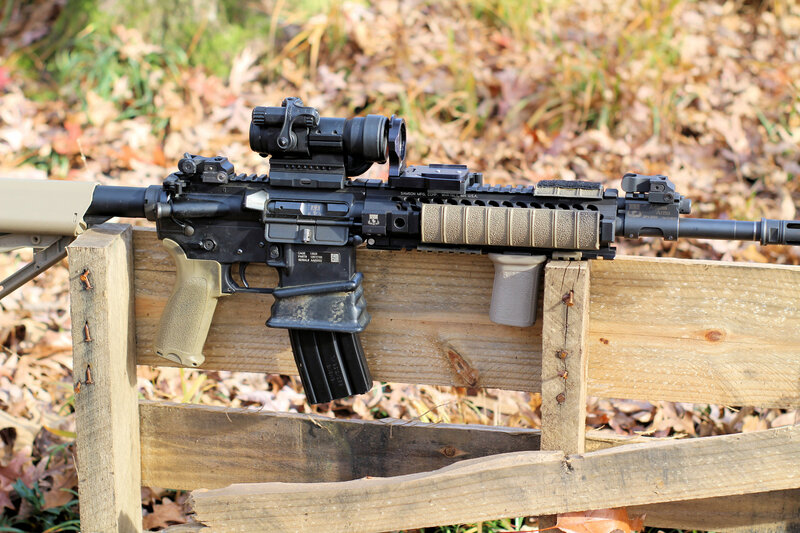 Alpha Tara mounted on Adams Arms 14.5 piston AR. Still plenty of room left on this mid-length handguard for an IR laser and a place for the support hand to grasp on to the handguard. Before using the Alpha Tarac, I first shot some groups using the ammunition that I was going to test it with, 55gr. M193, just with the Aimpoint Pro at a USPSA target at 200 yards, then 400yds. The purpose was to both check my zero to ensure I had a true 200-yard POA/POI, then at 400 yards just to confirm the hold-over I normally use. For 400 yards, I have to place the red dot (which appears as an 8-inch circle) just slightly above the target’s head. This makes up for the roughly 2 feet of bullet drop at that range with a 200-yard zero. Next, it was time to shoot 400yds on paper with Aimpoint and Alpha Tarac optical accessory. For my first string of five rounds, I aimed center-mass of the target (center of A-zone box). The result: all rounds impacted high in the neck area of the target (C, D, and B-zone head). Although they were hits, I wanted to see if I could hit exactly center. To do so, I ended up needing to aim about eight inches low below the center of the target. I basically dropped my dot one width of itself down, since it appears as an 8-inch circle. On the left, my 200-yard confirmation of POA/POI with Aimpoint Pro. Right, my second five round string at 400yds using the Alpha Tarac Optical Accessory. Red circles indicate the point of aims I used. Although I did have to drop my point of aim slightly (8 inches) to get center hits at 400yds, that was well within the 20×20-inch capability TACOMHQ had stated, and it indeed allowed me not to have to use a hold-over to get hits. Sure, using a true center hold, the impacts were a little high, but they were still hits. Seeing how it was off true center by only mere inches, I figure this is pretty damn good, especially considering the generic, non-match ammunition I was shooting out of a 14.5’’ barrel. Satisfied with the results on paper, it was time for a more practical test. 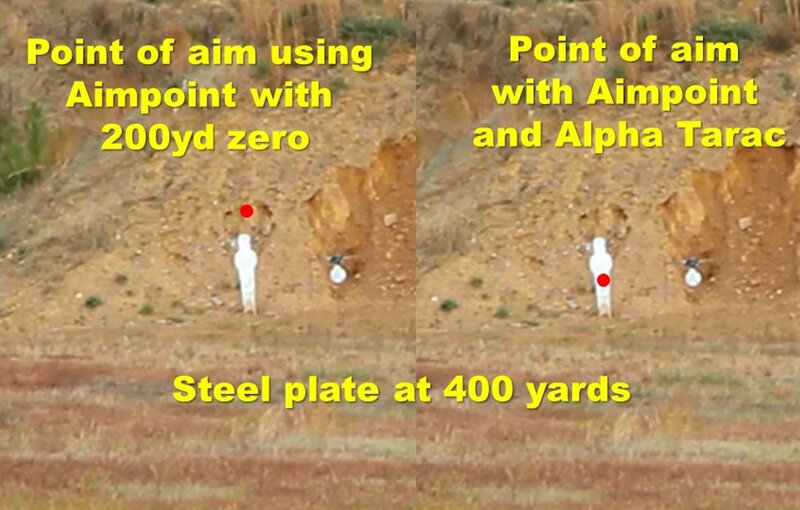 For this, I decided to shoot a little drill where first I would shoot at a 200yd plate using just the Aimpoint Pro. Then, as fast as I could, I’d flip up the Alpha Tarac and shoot a string of fire at a 400yd plate. My intent was to simulate being in a rifle match and shooting targets at a range I could hit using center holds, the Alpha Tarac of course allowing me a center hold at 400yds. Side-by-side comparison of the two holds I used to hit 400yd steel plate. Left, Aimpoint Pro about two diameters of the dot as it appears stacked above the target. Right, with Alpha Tarac, I just aimed slightly low of center. Just how well did I do? Pretty well, I thought. Watch the video below. The misses I did have at 400yds were not due to being off with the range, via incorrect hold for elevation (I used a 6-oclock hold on steel). Instead, the misses, as you will see, are off left and right. This I blame on the poor wind holds I used for the slight breeze I had going during the test. Going back and answering why use an Alpha Tarac in the first place over a LPVO or a magnifier? Well first off, you can in fact use it in conjunction with a magnifier. So not only would you get the extra magnification via the magnifier, but also now you’d have much less drastic holds for long-range targets. Additionally, TACOMHQ has other models designed specifically for use with scopes. Personally, I don’t like magnifiers, since you have to make space for the magnifier, and the red dot must be mounted far forward on the rifle, which I don’t care for. But really the big problem I have with magnifiers is they also magnify the dot in the optic. 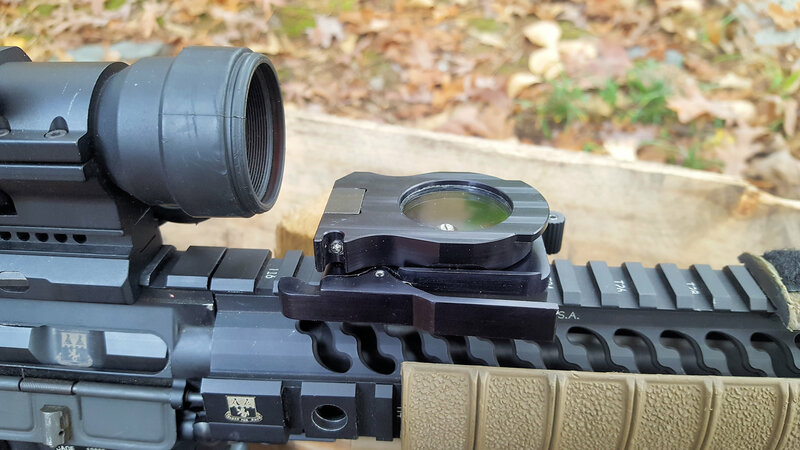 With a 4X magnifier, aiming at a 400yd target, a 2-MOA dot in an Aimpoint will now appear as an 8-inch dot. At a 400yd target, it will then appear as at least a 2ft diameter dot, most likely obscuring the width of the target, actually making it harder for a precise hold. Now, if I were expecting a fight at all distances, then certainly a LPVO is what I would choose. However, if my primary mission were CQB, and my carbine was rigged with a red dot where I was not expecting to have to shoot long-range, then I’d most certainly mount an Alpha Tarac, just in case it does turn into a long-range fight. Having that precise POA/POI at 400yds would definitely come in handy and make shooting targets at extended ranges much easier. Even if the targets were past 400yds, with the Alpha Tarac, the holds required would be a lot smaller than the holds with a 200yd zero. This of course translates to “the smaller the hold, the quicker the aim”, which equals faster shooting. 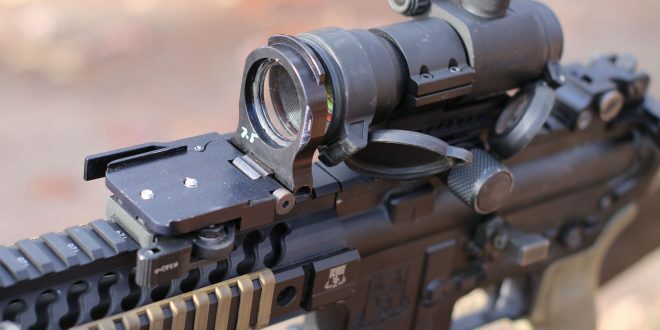 Compact and well-built, the Alpha Tarac optical accessory offers a capability that hasn’t existed before, the ability to have two different zeros with a red dot optic. Whether you use it with just a red dot or in conjunction with a magnifier, the Alpha Tarac is a great option for enhancing one’s capability at hitting long-range targets. Whether it’s on the battlefield or at a local gun match, having the ability to switch zeros on the fly to address long-range threats is a great capability.